I have no idea if there are local rules about anchoring off the beach in your area. It is obvious if there no rules the safety aspect is first and foremost. Weather is the first, second is a proper sized anchor and rode with chain. Then you should always have an anchoring light with 360 visibilty. You can't have too much visibility at night. Anchor light is about the only regulatory thing that I can think of, since it is not in a mooring area or harbor. Maybe best to check any local authorities as well. When you say 'surf' . . . yet usually calm conditions, are we talking flat to 1 ft waves? or more than that? I can't say what the situation is where you intend to do this. 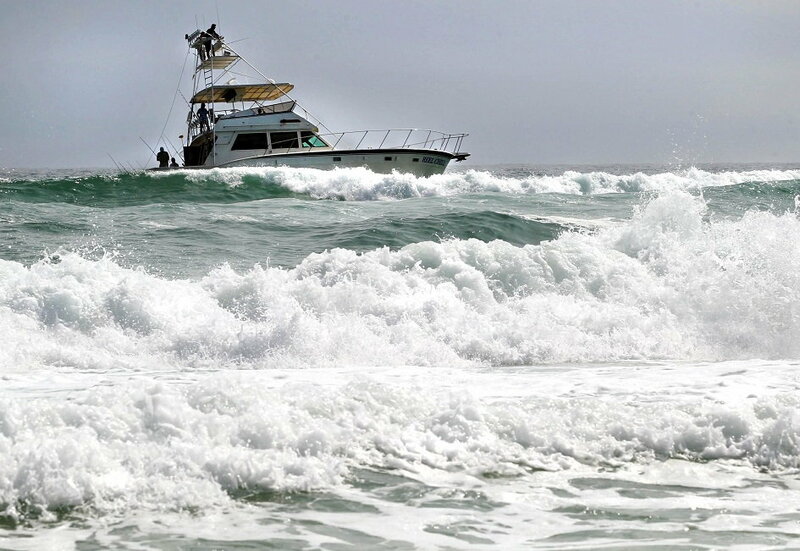 As far as my local rules are concerned, our lifeguards would have something to say about that, such as, "You are in a surfing/swimming area, anchoring is prohibited, please move your boat at least 1,000 yards off the beach." Of course we have surf. Etiquette would require the prompt removal of all pieces of a boat from the beach, should it be caught inside the surfline and break up. 1 or less. I wouldn’t do it if it wasn’t pretty close to glass. Anybody know if boats tie up overnight at Crab Island just inside Destin Pass? Get yourself a decent anchor (or two, to keep the bow pointed out to sea) and a good anchor light (led saves lots of battery) and go for it if conditions are calm-ish. You will obviously know when it's to rough. No idea about local rules, but you would need an anchor light at a minimum. Regarding safety and security of the boat.....definitely "not smart." But.....do you feel lucky? If securely anchored and it's a quiet night, then you likely would be fine. If you get a popup storm or high winds.....maybe you've got problems. Check your insurance policy. Also I do not know the area so not sure if you are inviting thieves by leaving a boat out there. I am far too cautious to do something like that unless I had no other option and the boat was expendable. After checking the weather, tide and surf forecast, I'd anchor up overnight there without hesitation. Especially if it looked like that. Its gorgeous! NO BOATING near the beach. An Okaloosa County Ordinance requires motorboats (including jet skis, wave runners, etc.) 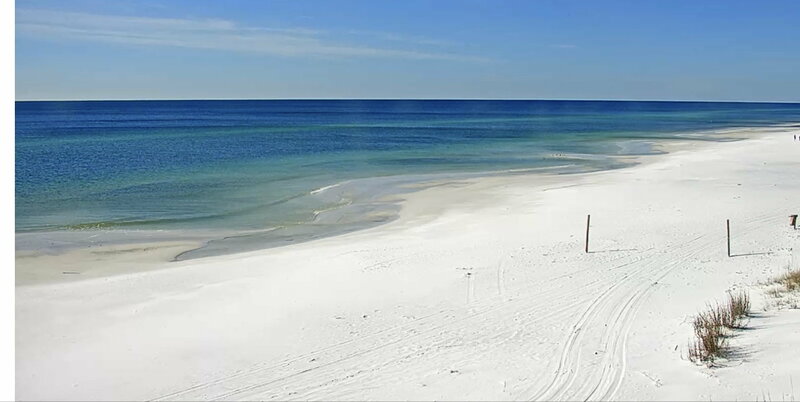 to stay at least 700 feet from the Gulf shoreline. The relevant portions of the Okaloosa ordinance follow. The exemption for establishing corridors does not apply to the Gulf beachfront, but only to bay and sound shorelines. Knowing my neighbors, I will bet that running near the beach and tying up in the surf at night will lead to an unpleasant encounter with the local sheriff. Section 4. Gulf of Mexico-Watercraft distance from shore, generally. A. The operation of any motorized watercraft within seven hundred (700’) feet of shoreline of the Gulf of Mexico in Okaloosa County including the incorporated areas is hereby prohibited subject to the exemptions provided in Section B hereof. a. The corridor must be as least twenty (20’) feet in width and not greater than forty (40’) feet in width and extending seven hundred (700’) feet perpendicular to the shore. Only one corridor will be allowed on each site. b. The corridor is to be clearly marked along both sides with orange buoys that are at least eighteen (18”) inches in diameter and anchored seven (700’) feet from the shoreline. Marker buoys must be removed when the corridor is not in use. d. Entrance into the corridor from the shoreline must be marked by orange or red cones which must be at least twenty-eight (28”) inches high erected at the waterline. e. There shall be posted landward of the corridor a sign advising the public of the corridor and posting notice for vessels to proceed under idle speed. f. Swimming, surfing, sailing or wading shall be prohibited within the corridor but non-propeller driven motorized watercraft shall yield the right of way to any persons located therein. g. Non-propeller driven motorized watercraft shall be limited to the entry/exit corridor when closer than seven hundred (700’) feet from the shoreline and shall not exceed the idle speed or five (5 m.p.h.) miles per hour, whichever is greater, when within the corridor. I'm familiar with the area. I would anchor up OUTSIDE the second sand bar. This way is waves kick up the boat doesn't get washed over. That would probably cover the 700ft rule as well. xl883lo and HuntersDad like this. Just leave it behind someone's house in the middle of a canal. How will you get to shore?? Give it a few hours and it might change. It can just as often look like this (pictures of Okaloosa and Walton County below)............It is the GOM not Lake Lanier. Seriously......is this a troll??? crab island is probably not the best idea for a place to anchor overnight. Okaloosa county and the Destin city council spent considerable time making sure there were no floating barges or structures anchored overnight and i'm not sure how they would look at a moored and unmanned vessel doing the same. anchoring near shore is not allowed in Walton county and I would not recommend it. weather changes quickly and flat seas can become nasty overnight. if you are a resident there is a permit process for launching off of the beach in certain areas but that presents its own set of issues. best bet is to try to find a slip close to the pass when you're in town. On busy holidays I like to get a few adult beverages out on the deck at AJ's and watch the harbor traffic.........more fun than a busload of morons at the boat ramp. One time saw a man and woman who appeared to be very inexperienced paddle boarders decide they wanted to cross over from the condos over on Norrieggo Point to the Harborwalk Village. They followed the island shoreline all the way up to Margaritaville and tried to cross the channel about the same time a line of about 5 or 6 of the sport fishing fleet (along with several other boats) were coming in.......they were lucky they survived. Dude in a pontoon rescued them and almost got t-boned in the process. Last edited by xl883lo; 12-05-2018 at 03:32 PM. The OP beach pic is BEAUTIFUL. I'm jealous now.